Followed by Croatia, UK International Summer School Camp, and British Students and Family Camps. Plus book your own weekend away. Beach Volleyball Inc is my company, Denise Austin, founded in 2000. I have been passionately involved in anything around beach volleyball since 1990. 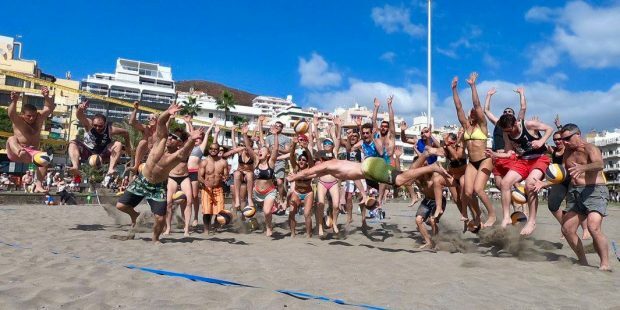 Beach Volleyball Inc provides many services of coaching for any level player, with our successful beach volleyball camps in Croyde, Barry Island, Bournemouth, Yellowave, Worthing, Barn Elms, Keele, Loughborough, Oxford, Tenerife, France, Croatia and Italy. We cater for the complete beginner to budding international players. If you are looking to develop your beach volleyball coaching skills then we offer individual learning through working alongside our coaching or if you would like to run a beach volleyball coaching course for your club then I am the Staff Tutor for beach volleyball for Volleyball England. BVInc provides free phone consultations for anyone looking to build a beach volleyball court and can also help you build them, I love to collect sand and I have a sample of most of the beach courts across the UK. We will help with the suitability of your local sand suppliers or if you just need some helpful advice when you start building we are on the end of the phone through the whole process. It has been my honour to help pioneer and continue the growth of the sport in the UK and if you can’t see what you are looking for just ask and we will endeavour to provide or find it for you.